On October 9th, 2018, Jim went in for a scheduled hip replacement revision. Upon evaluation, his doctor discovered a slight crack in his tibia bone. In order for the revision to be successful, Jim had to get another surgery just three days later. After his back-to-back surgeries were complete, he was notified that he would need further rehabilitation services. As active volunteers at the New Providence Senior Center, Jim was familiar with all that Chatham Hills has to offer as a subacute rehab and knew that was the place he wanted to go. Jim and his wife are very active in the New Providence Senior Center community. Jim is a very diligent bridge player while his wife is the “Sunshine Lady”, who goes around bringing joy to other seniors. He is also an active member of his church. When Jim was admitted to Chatham Hills, he had a goal to walk again and be able to transfer in and out of the car. Jim was greeted by our highly-trained therapists, Steve and Michelle. During his initial assessment, he needed maximum assistance with transfers, was unable to climb stairs, only able to ambulate five feet using a rolling walker with contact guard assist and was in a great deal of pain upon leg movements. Secondary to his hip fracture, there were specific precautions that had to be taken such as being unable to bend down or cross his legs. In return, these precautions made a task of putting on pants very difficult. 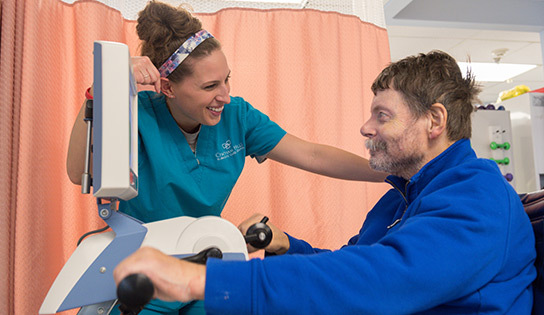 His occupational therapist, Michelle, worked closely with him teaching him how to successfully use adaptive equipment to independently perform lower body dressing while maintaining those said hip precautions. Jim required skilled physical and occupational services to return to his prior level of function as independent with all activities of daily living. He participated in therapy six days a week consistently practicing transfers, clothing management and energy conservation techniques. Although it was taking time, Jim was very compliant and made steady progress toward reaching his short term and long term goals. Nathan Chen once said, “Never give up. There are always tough times, regardless of what you do in anything in life. Be able to push through those times and maintain your ultimate goal.” Jim identified with this quote after his time at Chatham Hills Subacute Care Center due to staying motivated and also having a strong support system from his wife and community center. Team Chatham Hills is incredibly proud of Jim for his success here and continued success at home!